It seems these days pretty much any band that ever plugged in an amplifier is staging a reunion whether there was ever a need for it or not. A lot of these reunions turn out to be as bad as the original go-round. But occasionally, there is a reunion of a band that had everything necessary for a long run of success but just didn't quite get there. No one's fault, just things didn't break the way they needed to. But you miss the band and hope that there will come a time that you'll get to hear more from that band or particular lineup of said band. For fans of CHASTAIN, that time is now. Vocalist Leather Leone has rejoined the band along with guitar maestro David T. Chastain and bassist Mike Skimmerhorn. They've added drummer Stian Kristoffersen and set out to set the world on fire. For fans of the, if you'll pardon the cliched play on words, leather lunged vocals of Leone, you'll be glad to know that she still can employ that razor blade vocal style. Throughout the majority of the album, she rings through loud and clear. But there were moments when the production seemed to muddy her singing in the mix. The album is composed of mostly fast paced and anthemic tracks. It opens with "Stand and Fight" which is a primary example of this. The songwriting does modify itself to change up the pacing a bit on a few songs, but for the most part it is straight forward metal. A few of the songs tend to sound very similar and came off as a bit repetitive despite the topical changes in the lyrics. I liked the track "I Am Sin", which managed to pull off a slight more methodical pacing while still landing on the plus side of fast and furious. Pacing played a big part in my enjoyment of "Fear My Wrath" as well. Try as I might, the far slower and very heavy sounding "Bleed Through Me" just didn't resonate though. The two songs the band released early on the Internet ("Deep Down In The Darkness" and "Freedom Within") were both excellent and were just a little more enjoyable to hear via a CD rather than through a less than optimal set of speakers on the computer. Without a doubt, the standout number on the disc is "Call of the Wild". The vibrantly constructed song is pure electricity as the band just finds another gear and blows through one of the better songs I've ever heard from them. 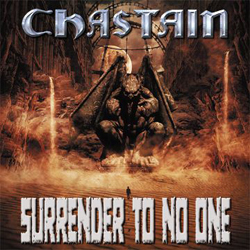 I don't know how Surrender To No One will stack up against past CHASTAIN releases. Despite an overabundance of anthem rockers to choose from, other than "Call of the Wild" there doesn't seem to be one on the level of past hit tracks like "Voice of the Cult" or "For Those Who Dare". To be sure, I welcome the return of the Leone fronted CHASTAIN and I did enjoy the new CD as a whole but there was just a tiny bit of that special something missing to push Surrender To No One from being a good album to being a ball breaking great one.